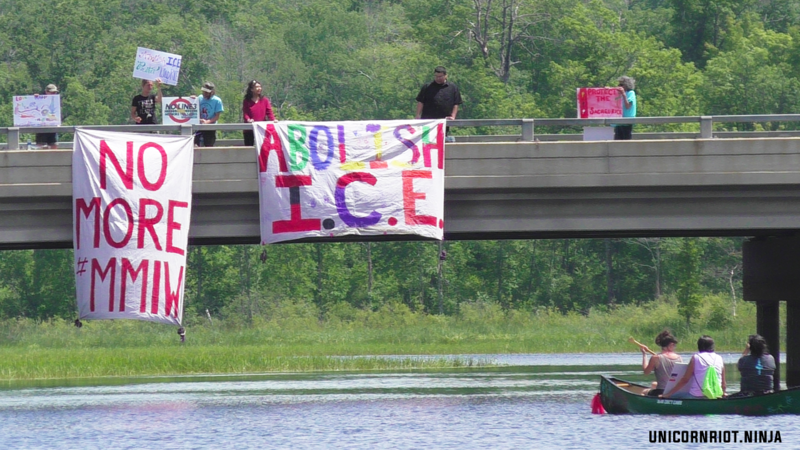 Big Sandy Lake, MN – Camp Healing Souls, a Ojibwe cultural camp in northern Minnesota joined an #AbolishICE day of action on July 17, 2018. 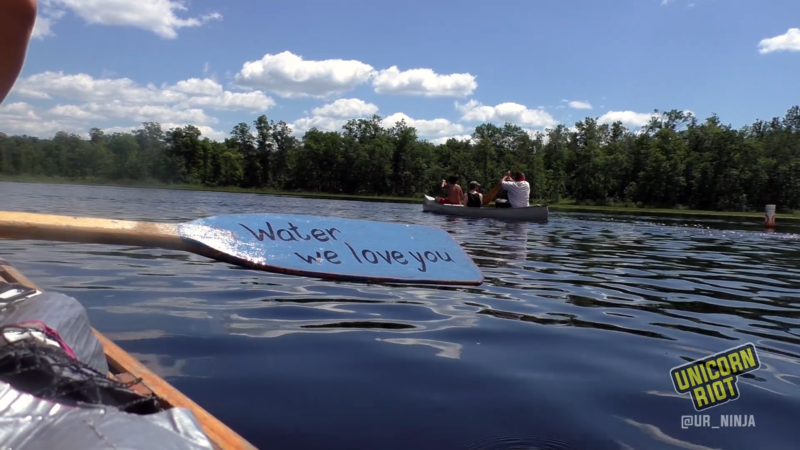 The camp organized a small flotilla of local water protectors, children, and residents to canoe across Big Sandy Lake. The flotilla unfurled a “Stop Line 3” banner, and on the bridge over the lake, banners were dropped in solidarity with #AbolishICE and bringing attention to Murdered and Missing Indigenous Women (#MMIW) movement. Camp Healing Souls joins Solidarity Actions to #AbolishIce from Unicorn Riot on Vimeo. We spoke to Tania Aubid, who helped organize the flotilla, she explained their connection to those being detained along the United States border, “They are our relatives too that are from the southern areas down there like South America, Mexico and all those places.” She spoke about how before the creation of these countries the indigenous people were able to freely travel between areas. We were able to livestream the flotilla and speak to Sandra Skinaway from the Bullhead clan and a descendant of the chiefs of the Sandy Lake band and the Mississippi Chippewa of the 1700s who said they lived all their lives on Big Sandy Lake. She spoke of the history of the area and the 1855 treaty that created the six reservations in the area, and that the treaty still stood today. She told us about the Big Sandy Lake tragedy, when the Indian Agents (Pre-BIA, Bureau of Indian Affairs) moved the annuity payments to the Big Sandy Lake, and that the payments never arrived. One hundred and fifty people died waiting in the area, from dysentery and small pox. When they finally left to return home 250 people died during the return after never receiving the promised payments from the United States Government. Sandra Skinaway explained that life in the area is nice, with the lakes and the rice. That they monitor the Army Corps use of the dam to make sure they don’t harm the wild rice by raising or lowering the water too far. We asked her what other physical things that have changed. She said there are less wild rice crops and that they use to be really abundant, and land base is gone, mostly taken over by resorts and cabins. She explained that wild ricing is part of their lives and culture and that people monitor the rice and make sure it’s growing well, and that the plant is coming up good. She also explained that no-wake zones are important to protect wild rice and pointed to some thinned out areas that were probably damaged by wakes caused by motorized boats. We ended the day talking to Tania Aubid, from Camp Healing Souls a Ojibwa culture camp. She explained her goal of teaching the youth of the area their tradition ways,and letting them dictate how the camp expands. She said, “I want to make sure when I’m gone. That they have something,and that’s why they are building it, and they are telling us where they want things, because it will be their camp.” She also said that their sovereignty as a nation was under attack, by the continual threats to their wild rice and their way of life. Enbridge’s Line 3 being the latest attack on their livelihood. Unicorn Riot plans to continue to travel up north and learn more about the way of life many have told us has been under constant attack. With the recent approval of the Line 3 pipeline locals in northern Minnesota have invited us to see what is under threat. Join us July 25th as we learn more about the Sandy Lake tragedy, and keep following our feeds to get an on the ground view of northern Minnesota, and those trying to preserve their way of life.